If It's Hip, It's Here (Archives): Gaultier Brings The 80s Back With Fashion Homages to Grace Jones, Madonna, Annie Lennox, Boy George and More. Gaultier Brings The 80s Back With Fashion Homages to Grace Jones, Madonna, Annie Lennox, Boy George and More. As the latest Ready-to-Wear collection by fashion designer Jean Paul Gaultier walked down the runway during Paris Fashion Week, some might have felt they were tuning into MTV circa 1984. Inspired by eighties Pop singers who have influenced fashion over the past three decades,Gaultier presented various pieces ranging from tuxedo styled pantsuits to corsets and fishnets, accompanied by era-appropriate music such as Bowie's 1980 hit "Fashion" and Madonna's "Vogue"
The Material Girl (Madonna) was fully represented in looks harkening back to her 1985 movie, Desperately Seeking Susan and Michael Jackson's fedora, glove and jackets were made an appearance as part of the Spring 2013 collection. Satin and leather baseball jackets and matching knickers brought up flashbacks of ABBA and Amanda Lear made a cameo appearance as the show came to a close. The hair, make up and styling deserves a bow as well, that's for sure. 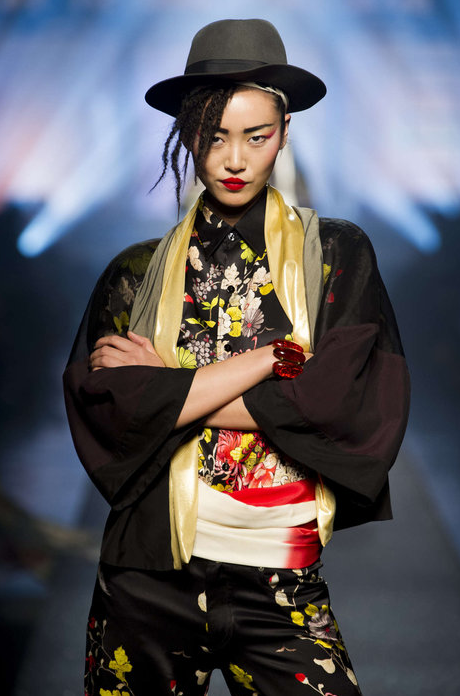 See the entire Jean Paul Gaultier 2103 Spring RTW collection here. You forgot to mention that in the 80's, Boy George from Culture Club wore Sue Clowes printed t-shirts with printed designs which are still recognizable. They were hers not Boy George, and she is still doing her prints.